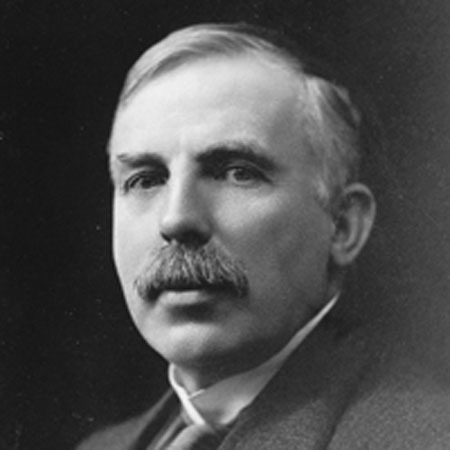 The fourth of 12 children, Ernest Rutherford was born to poor parents in Spring Grove, New Zealand, on August 30, 1871. A popular and athletic boy, he won scholarships to an advanced high school and then to college in New Zealand. In 1895 he moved to the famous Cavendish Laboratory at Cambridge, England, where he immediately attracted the attention of the lab’s director, J. J. Thomson, as well as the jealousy of some of the older scientists. A year later, the French physicist HENRI BECQUEREL discovered that uranium emitted rays that could expose photographic film (called radioactivity by CURIE in 1898), as did X­rays. Rutherford soon demonstrated that the uranium rays consisted of two types, which he named alpha and beta. He believed they were made of minute bits of matter, and he later showed that alpha particles were helium atoms, but without electrons. His early success won the attention of many university leaders, and he was hired as a professor at McGill University in Montreal in 1898. By 1902 he and a young chemist, Frederick Soddy, had concluded that when an atom like uranium decays by emitting an alpha or beta particle, it converts to an atom of an entirely new element, which is also often radioactive. They identified several families of radioactive elements where each member turned into the next by radioactive decay, a discovery that won Rutherford the Nobel Prize for Chemistry in 1908. Manchester University brought him back to England in 1907, where he continued his brilliant but simple experiments. The most famous began in 1911, when Rutherford used alpha particles from radium as bullets to probe into a thin gold foil. His student, Hans Geiger, had developed a gas­ filled tube to count alpha particles, and together Rutherford, Geiger, and another student, Ernest Marsden, counted the particles penetrating the foil. If the then ­current model of the atom as a spongy ball was correct, the alpha particles should have all blasted straight through and, in fact, most of them did. But the team was amazed to find that a very few alpha particles actually bounced away at large angles, sometimes even ricocheting straight back. Rutherford’s explanation was that all of the positive charge and virtually all of the mass of an atom were concentrated in a tiny spot at the center, the nucleus. In 1919 Rutherford produced the first nuclear reaction when be bombarded nitrogen atoms with alpha particles, producing oxygen and hydrogen. In that same year he returned to the Cavendish Lab to serve as the new director. He was knighted in 1914, made a baron in 1931, and died in Cambridge on October 19, 1937. Rutherford’s discovery that atoms have nuclei was a groundbreaking step in science for the twentieth century. Like all scientific discoveries Rutherford’s produced new questions. What kept the tiny electrons so far from the nucleus? Since opposite charges attract, why didn’t the positive nucleus take in the negative demons in an instant? It could not be that the electrons move too fast to fall in, because electrons circling that rapidly should radiate away large quantities of energy, but they do not. Fifteen years passed before Louis de Broglie and Erwin Schrödinger realized that electrons are not tiny specks, but extended waves that wrap around the nucleus, and their wavelength happens to be atom­sized, large compared to the tiny nucleus. In this way; Rutherford’s work helped fuel the great discoveries of quantum theory, the greatest advance in physics in the twentieth century. Rutherford’s experiments with nuclear reactions and radioactivity suggested that nuclei could be manipulated and used for other purposes. In nuclear medicine, for example, radioactive compounds are used to diagnose and treat some illnesses. Rutherford had a gift for being right in his hunches and insights, and the only time he was certainly wrong was when he claimed in the early 1930s that releasing quantities of energy from nuclei, was “pure moonshine.” Nuclear weapons and power plants prove that we can cause some atoms, at least, to spew out huge amounts of energy. Perhaps Rutherford’s greatest legacy was the swarm of students whose work he encouraged. He was always willing to share with students, and most scientists who contributed to nuclear physics in the first half of the twentieth century had worked with Rutherford. Posted on March 10, 2015 by Natalie. This entry was posted in Physicists. Bookmark the permalink.